Download "Reducing multiclass to binary by coupling probability estimates"
4 (a) For each i 1 2 k ˆp i x s t M i ˆp i 1 n r x s t M i 1 n 1 r x x s t M i 1 n ˆr x s t M i 1 n 1 ˆr x () Renormalize the ˆp i x. (c) Recompute the ˆr x. If the code matrix is the all-pairs matrix, this algorithm reduces to the original method y Hastie and Tishirani. Let B i e the set of matrix columns for which M i 1 and B i e the set of matrix columns for which M c 1. By analogy with the non-iterative estimates suggested y Hastie and Tishirani, we can define non-iterative estimates p i x B i x 1 B r i x. 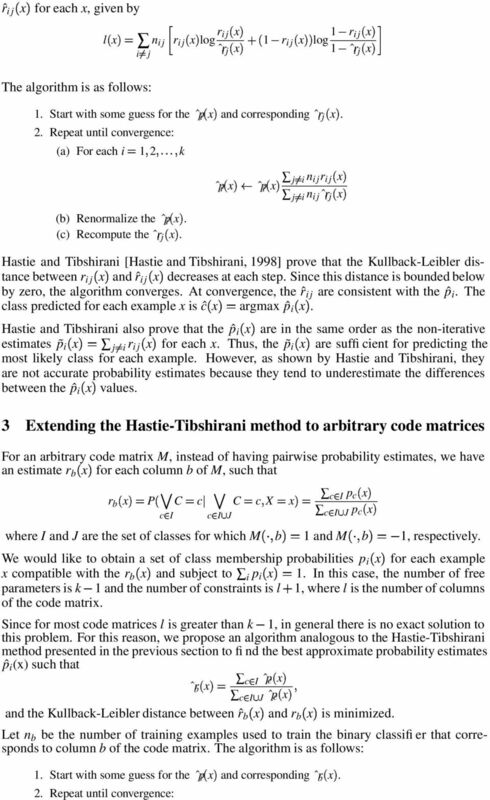 For the all-pairs code matrix, these estimates are the same as the ones suggested y Hastie and Tishirani. However, for aritrary matrices, we cannot prove that the non-iterative estimates predict the same class as the iterative estimates. 4 Loss-ased decoding In this section, we discuss how to apply the loss-ased decoding method to classifiers that output class memership proaility estimates. 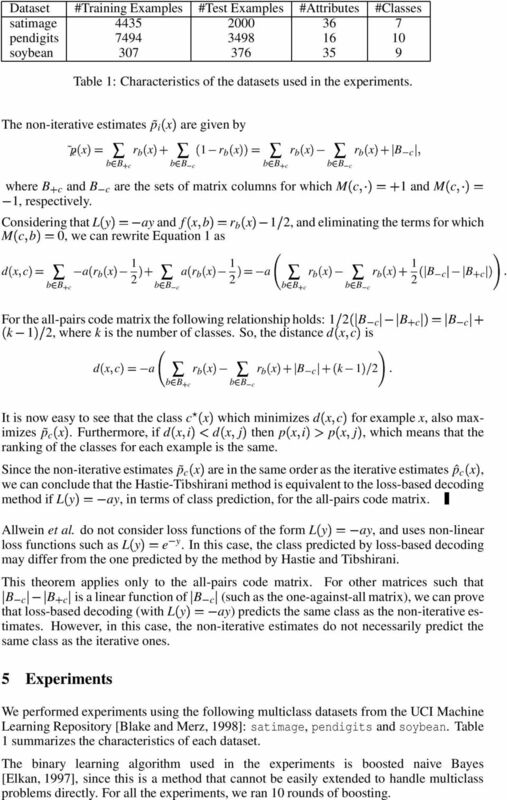 We also study the conditions under which this method predicts the same class as the Hastie-Tishirani method, in the all-pairs case. The loss-ased decoding method [Allwein et al., 2000] requires that each inary classifier output a margin score satisfying two requirements. First, the score should e positive if the example is classified as positive, and negative if the example is classified as negative. Second, the magnitude of the score should e a measure of confidence in the prediction. The method works as follows. Let f x e the margin score predicted y the classifier corresponding to column of the code matrix for example x. For each row c of the code matrix M and for each example x, we compute the distance etween f and M c as d L x c l L M c f x (1) 1 where L is a loss function that is dependent on the nature of the inary classifier and M c = 0, 1 or 1. We then lael each example x with the lael c for which d L is minimized. If the inary classification learning algorithm outputs scores that are proaility estimates, they do not satisfy the first requirement ecause the proaility estimates are all etween 0 and 1. However, we can transform the proaility estimates r x output y each classifier into margin scores y sutracting 1 2 from the scores, so that we consider as positives the examples x for which r x is aove 1/2, and as negatives the examples x for which r x is elow 1/2. We now prove a theorem that relates the loss-ased decoding method to the Hastie- Tishirani method, for a particular class of loss functions. 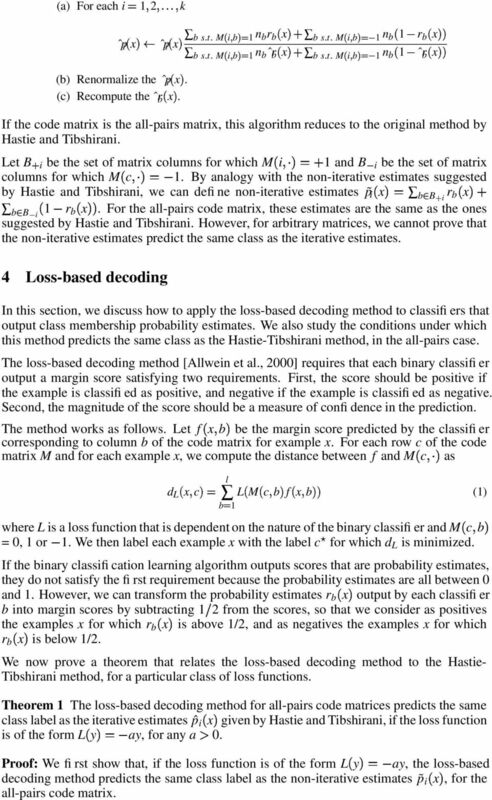 Theorem 1 The loss-ased decoding method for all-pairs code matrices predicts the same class lael as the iterative estimates ˆp i x given y Hastie and Tishirani, if the loss function is of the form L y ay, for any a 0. Proof: We first show that, if the loss function is of the form L y ay, the loss-ased decoding method predicts the same class lael as the non-iterative estimates p i x, for the all-pairs code matrix. 5 Dataset #Training Examples #Test Examples #Attriutes #Classes satimage pendigits soyean Tale 1: Characteristics of the datasets used in the experiments. The non-iterative estimates p i x are given y p c x x 1 r x B c x x B c B c where B c and B c are the sets of matrix columns for which M c 1 and M c 1, respectively. Considering that L y ay and f x r x M c 0, we can rewrite Equation 1 as d x c a r x 1 2 a r x B c 1 2 a 1 2, and eliminating the terms for which x x B c For the all-pairs code matrix the following relationship holds: 1 2 B c k 1 2, where k is the numer of classes. So, the distance d x c is d x c a r x B c k 1 2 x B c 1 2 B c B c B c It is now easy to see that the class c x which minimizes d x c for example x, also maximizes p c x. Furthermore, if d x i d x j then p x i p x j, which means that the ranking of the classes for each example is the same. Since the non-iterative estimates p c x are in the same order as the iterative estimates ˆp c x, we can conclude that the Hastie-Tishirani method is equivalent to the loss-ased decoding method if L y ay, in terms of class prediction, for the all-pairs code matrix. Allwein et al. do not consider loss functions of the form L y ay, and uses non-linear loss functions such as L y e y. In this case, the class predicted y loss-ased decoding may differ from the one predicted y the method y Hastie and Tishirani. This theorem applies only to the all-pairs code matrix. For other matrices such that B c B c is a linear function of B c (such as the one-against-all matrix), we can prove that loss-ased decoding (with L y ay) predicts the same class as the non-iterative estimates. However, in this case, the non-iterative estimates do not necessarily predict the same class as the iterative ones. 5 Experiments We performed experiments using the following multiclass datasets from the UCI Machine Learning Repository [Blake and Merz, 1998]: satimage, pendigits and soyean. Tale 1 summarizes the characteristics of each dataset. 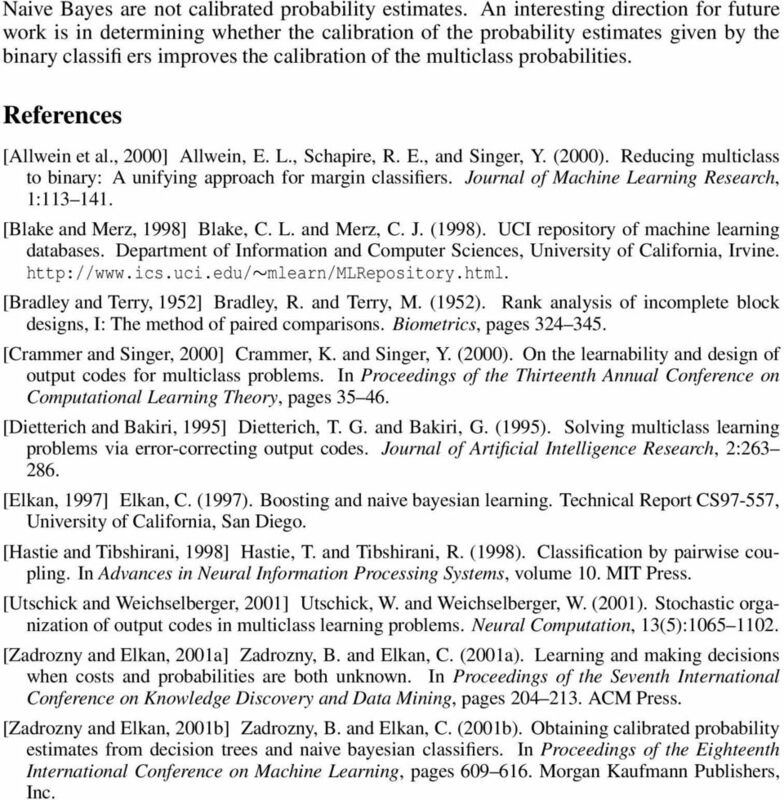 The inary learning algorithm used in the experiments is oosted naive Bayes [Elkan, 1997], since this is a method that cannot e easily extended to handle multiclass prolems directly. For all the experiments, we ran 10 rounds of oosting. 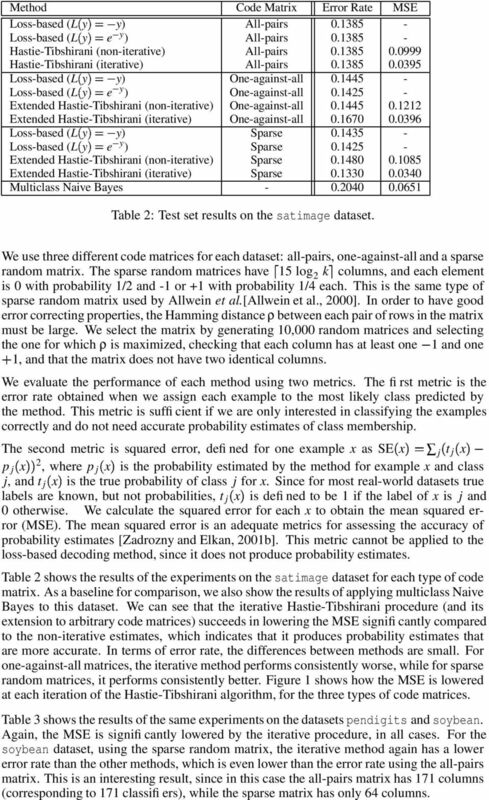 6 Method Code Matrix Error Rate MSE Loss-ased (L y y) All-pairs Loss-ased (L y e y ) All-pairs Hastie-Tishirani (non-iterative) All-pairs Hastie-Tishirani (iterative) All-pairs Loss-ased (L y y) One-against-all Loss-ased (L y e y ) One-against-all Extended Hastie-Tishirani (non-iterative) One-against-all Extended Hastie-Tishirani (iterative) One-against-all Loss-ased (L y y) Sparse Loss-ased (L y e y ) Sparse Extended Hastie-Tishirani (non-iterative) Sparse Extended Hastie-Tishirani (iterative) Sparse Multiclass Naive Bayes Tale 2: Test set results on the satimage dataset. We use three different code matrices for each dataset: all-pairs, one-against-all and a sparse random matrix. The sparse random matrices have 15 log 2 k columns, and each element is 0 with proaility 1/2 and -1 or +1 with proaility 1/4 each. This is the same type of sparse random matrix used y Allwein et al. [allwein et al., 2000]. In order to have good error correcting properties, the Hamming distance ρ etween each pair of rows in the matrix must e large. We select the matrix y generating 10,000 random matrices and selecting the one for which ρ is maximized, checking that each column has at least one 1 and one 1, and that the matrix does not have two identical columns. We evaluate the performance of each method using two metrics. The first metric is the error rate otained when we assign each example to the most likely class predicted y the method. This metric is sufficient if we are only interested in classifying the examples correctly and do not need accurate proaility estimates of class memership. The second metric is squared error, defined for one example x as SE x j t j x p j x 2, where p j x is the proaility estimated y the method for example x and class j, and t j x is the true proaility of class j for x. Since for most real-world datasets true laels are known, ut not proailities, t j x is defined to e 1 if the lael of x is j and 0 otherwise. We calculate the squared error for each x to otain the mean squared error (MSE). The mean squared error is an adequate metrics for assessing the accuracy of proaility estimates [Zadrozny and Elkan, 2001]. This metric cannot e applied to the loss-ased decoding method, since it does not produce proaility estimates. Tale 2 shows the results of the experiments on the satimage dataset for each type of code matrix. As a aseline for comparison, we also show the results of applying multiclass Naive Bayes to this dataset. 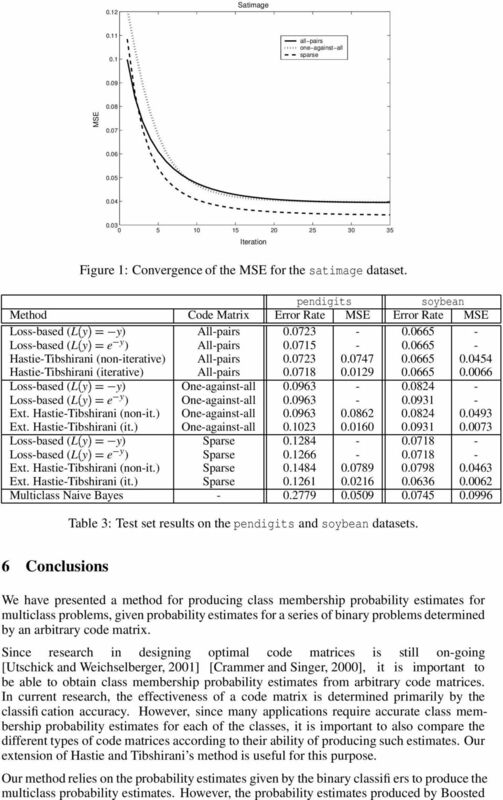 We can see that the iterative Hastie-Tishirani procedure (and its extension to aritrary code matrices) succeeds in lowering the MSE significantly compared to the non-iterative estimates, which indicates that it produces proaility estimates that are more accurate. In terms of error rate, the differences etween methods are small. For one-against-all matrices, the iterative method performs consistently worse, while for sparse random matrices, it performs consistently etter. Figure 1 shows how the MSE is lowered at each iteration of the Hastie-Tishirani algorithm, for the three types of code matrices. Tale 3 shows the results of the same experiments on the datasets pendigits and soyean. Again, the MSE is significantly lowered y the iterative procedure, in all cases. For the soyean dataset, using the sparse random matrix, the iterative method again has a lower error rate than the other methods, which is even lower than the error rate using the all-pairs matrix. This is an interesting result, since in this case the all-pairs matrix has 171 columns (corresponding to 171 classifiers), while the sparse matrix has only 64 columns. 8 Naive Bayes are not calirated proaility estimates. 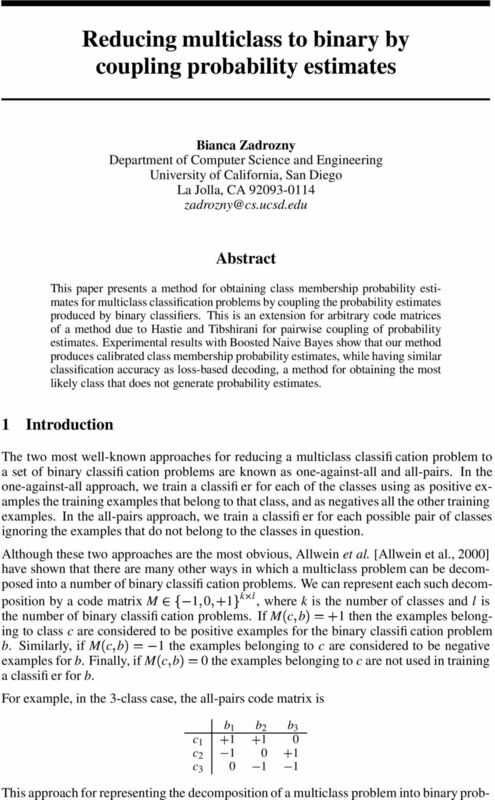 An interesting direction for future work is in determining whether the caliration of the proaility estimates given y the inary classifiers improves the caliration of the multiclass proailities. References [Allwein et al., 2000] Allwein, E. L., Schapire, R. E., and Singer, Y. (2000). Reducing multiclass to inary: A unifying approach for margin classifiers. 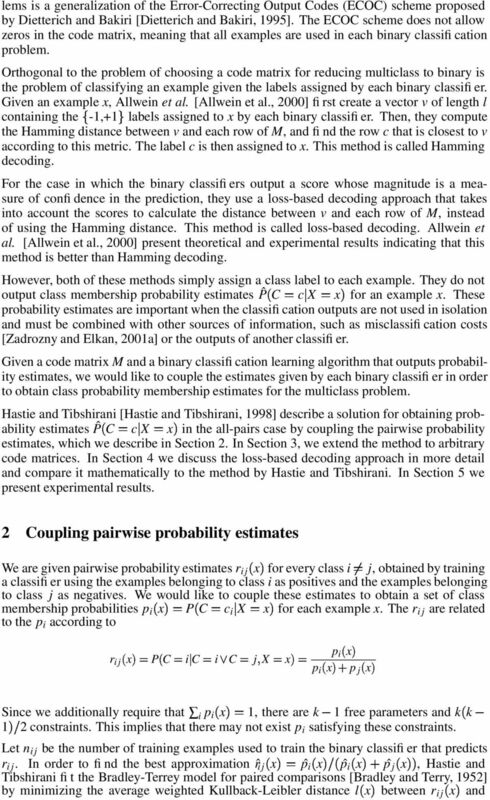 Journal of Machine Learning Research, 1: [Blake and Merz, 1998] Blake, C. L. and Merz, C. J. (1998). UCI repository of machine learning dataases. Department of Information and Computer Sciences, University of California, Irvine. mlearn/mlrepository.html. [Bradley and Terry, 1952] Bradley, R. and Terry, M. (1952). Rank analysis of incomplete lock designs, I: The method of paired comparisons. Biometrics, pages [Crammer and Singer, 2000] Crammer, K. and Singer, Y. (2000). On the learnaility and design of output codes for multiclass prolems. In Proceedings of the Thirteenth Annual Conference on Computational Learning Theory, pages [Dietterich and Bakiri, 1995] Dietterich, T. G. and Bakiri, G. (1995). Solving multiclass learning prolems via error-correcting output codes. Journal of Artificial Intelligence Research, 2: [Elkan, 1997] Elkan, C. (1997). Boosting and naive ayesian learning. Technical Report CS97-557, University of California, San Diego. [Hastie and Tishirani, 1998] Hastie, T. and Tishirani, R. (1998). Classification y pairwise coupling. In Advances in Neural Information Processing Systems, volume 10. MIT Press. [Utschick and Weichselerger, 2001] Utschick, W. and Weichselerger, W. (2001). Stochastic organization of output codes in multiclass learning prolems. Neural Computation, 13(5): [Zadrozny and Elkan, 2001a] Zadrozny, B. and Elkan, C. (2001a). Learning and making decisions when costs and proailities are oth unknown. In Proceedings of the Seventh International Conference on Knowledge Discovery and Data Mining, pages ACM Press. [Zadrozny and Elkan, 2001] Zadrozny, B. and Elkan, C. (2001). Otaining calirated proaility estimates from decision trees and naive ayesian classifiers. In Proceedings of the Eighteenth International Conference on Machine Learning, pages Morgan Kaufmann Pulishers, Inc.
GLM, insurance pricing & big data: paying attention to convergence issues. GLM, insurance pricing & big data: paying attention to convergence issues. Michaël NOACK - michael.noack@addactis.com Senior consultant & Manager of ADDACTIS Pricing Copyright 2014 ADDACTIS Worldwide. Generalized Inverse Computation Based on an Orthogonal Decomposition Methodology.